040. LIEUT. E. H. SHACKLETON. Issued by Hassan Cork Tip Cigarettes (American Tobacco Co.). (1914). Card unnumbered; from a set of 25 entitled "The World's Greatest Explorers". Size: Ca. 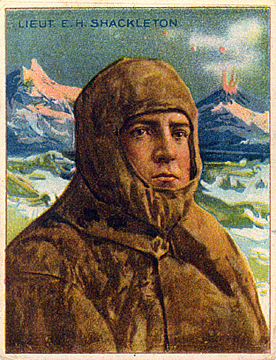 2.5" x 3.2".
. Recto: Portrait of Shackleton in polar clothing with Mt. Erebus (?) in background. In upper left corner: Lieut. E.H. SHACKLETON. Verso: THE WORLD'S GREATEST EXPLORERS | LIEUT. E. H. SHACKLETON | This antarctic explorer was born in Ireland, and soon after reaching maturity entered the British merchant marine service, and later was appointed one of the officers of the British national antarctic expedition under Captain Scott. The Nimrod, under command of Shackleton, sailed from London for the antarctic in the summer of 1907. The farthest south ever reached,latitude 88° 23', longitude 162° east, or only 11 miles from the pole, was attained by Shackleton's party on January 9, 1909. The second party pushed forward to the southern magnetic pole, latitude 72° 25', longitude 154° east. The British flag was hoisted at both points. --Albert Operti, F.N.A.G.S. | HASSAN CORK TIP CIGARETTES The Oriental Smoke. THE LARGEST SELLING BRAND OF CIGARETTES IN AMERICA. FACTORY NO. 30 2ND DIST. N.Y.